It’s kind of secret and please don’t tell the dogs, but…I’m a cat person. I grew up with cats—we always had at least one cat in our family, and for many years a gray domestic shorthair named Rascal was the most reliable alarm clock in the house. Every morning at 5am, she would sit on somebody’s neck until they couldn’t breathe and were forced to wake up. With all this cat experience and know-how stored up, it’s kind of weird that recently I found myself both felineless and urgently in need of a cat. One key character in my book Perfect Gravity is a cloned, cybernetically altered, talking cat named Yoink. And no matter how small they are or how innately judgmental or pushy, the tiny Chihuahua dogs currently living in my fuzzy blanket weren’t going to give me the research nuggets I needed. The search for a feline subject matter expert yielded two candidates: Oreokitty and General Leia. Oreokitty is my mother-in-law’s cat, and for a few months she came to live with me (the cat, not my mother-in-law), so I could observe her day-to-day and learn all things cat. However, it quickly became obvious that Oreokitty not a right cat. 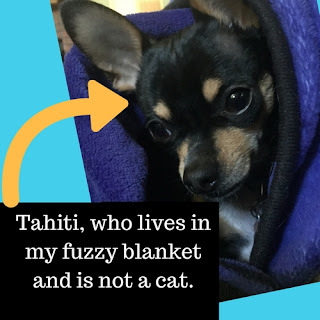 In fact, she was once a rat, or rather, she was a feral kitten who lived underneath the house and who got barked at by dogs so often that my mother-in-law at first thought she was a rodent infestation. 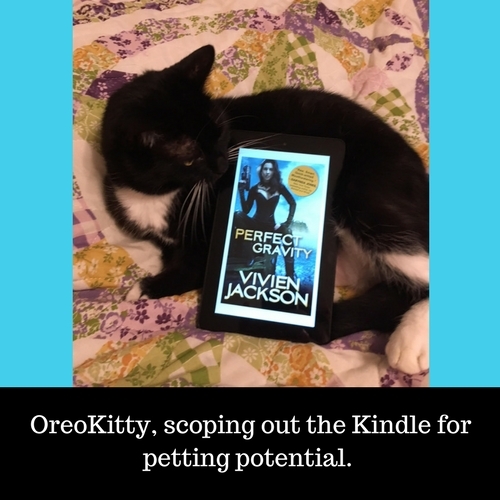 Once MIL realized the infestation was instead black and white and adorable, Oreokitty became a legit part of the family. Nowadays, she’s a girl who’s seen hard times and is persistently appreciative of the fact that she’s living the good life. Like, really appreciative. You can feed her anything and she will love you forever. She starts purring when a human so much as enters a room. She seeks head rubs from my cell phone. 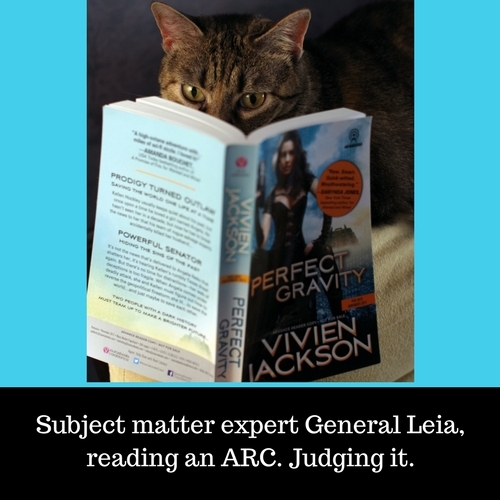 I needed Yoink to be somewhat less accommodating, so I hit up my critique partner for advice from her cat, General Leia, who is much closer to the character I needed for my story. General Leia is also a rescue kitty and so has some personality quirks, but it is from patient observation of her that Yoink developed a pushy demand for belly rubs and the ability to judge you constantly because you are clearly failing. At everything. She is judging you right now. And she is IN CHARGE. I also learned why cats like boxes (conservation of heat and protection on all sides while they sleep), why they like to sit on computers (heat again, plus there’s usually something interesting to look at, not to mention a human to annoy/laze near), and why Rascal woke us all up at stupid o’clock every morning (she was evil and … no, more likely she was hungry and we let her rule the house). Also (not at Quora this time) I read about crazysauce CIA experiments to create Cold War-era cybernetic spy kitties. Not even kidding. In the end, I have to imagine that Yoink, despite her quirks, isn’t the weirdest cat in the history of people being owned by cats. But she sure was fun to write and research. Vivien Jackson writes fantastical, futuristic, down-home salacious kissery. A devoted Whovian Browncoat Sindarin Jedi gamer, she has a degree in English, which just means she's read gobs of stuff in that language. Her debut science-fiction romance, Wanted and Wired, was selected as an Amazon Best Romance of 2017. The follow-up, Perfect Gravity, was a Amazon Best Book of the Month. With her similarly geeky partner, children, and hairy little pets, Viv lives in Austin, Texas, and tweets a lot. Veterans Day: Last Hurrah for Hero Dogs! The authors of Embrace the Romance: Pets in Space 2 would like to sincerely thank all the wonderful SFR Brigade members and readers for supporting this unique SFR collection and helping the book become a USA TODAY bestseller! It has now received over 100 glowing reviews on Amazon. But this blog isn't focused on the success of the anthology. November 11th is Veterans Day, and that's really what this post is all about. Our veterans. Those who served. Many of the authors of Pets in Space 2 have close ties to military vets or are veterans themselves. Each will be posting this week about their involvement or connection with the military, and why this cause is so important to them. This moving, must-read tribute by Pauline Baird Jones, one of the authors and organizers, to her veteran father is just one of the heartfelt statements of why we feel compelled to support our veterans. 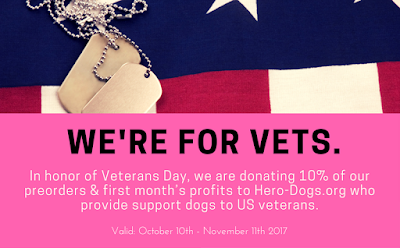 To honor our vets, we're donating 10% of the profits from all preorders and sales through Veterans Day to Hero Dogs. Hero Dogs raises and trains service dogs for US Veterans to make a difference in their lives. If you'd like to know more about what they do, please watch this video about their program narrated by veterans and staff. This is our Last Hurrah for Hero Dogs! We're in the final window for our Hero Dogs donation period. Last year we were able to donate over $2,000 to the organization, and this year we hope to do even more for them...but we aren't there yet. We need your help to reach our goal. If you haven't yet purchased a copy of this collection, please consider doing so before November 11th. For the price of a cup of coffee you can help change veteran's lives. If you've bought a copy of the anthology, thank you so much! You've already done something wonderful for this cause and we hope you loved all the stories from the twelve best selling and award winning science fiction romance authors as a bonus. Know someone who'd also love to read it? Consider gifting a copy of the book via Amazon's gifting feature. Just look for the "Give as a Gift" button on the right side of the sales page. An e-book or print copy could also make someone a great holiday gift this year! In closing, we'd like to take this opportunity to thank the entire science fiction romance community for helping us to help veterans. And hip, hip, hurrah for Hero Dogs! Monday - Authors Susan Grant, Michelle Howard and Sabine Priestley (in a video) explain their connection to the military or why they signed up for Pets in Space 2. Click here. Sylla Viola has never put down roots. When she's forced to abandon her life, she leaves everything behind. Nothing to miss. Nothing to regret. Not even the loss of her body. Using a DNA mod that changes her into a male half-human Scoriah, she's poised to get away from the hunter on her trail. Until she runs into the one man who can see through her disguise. Docked at Station Viesel, Echtei Bronson helps a lost male Scoriah. One minute in his company threatens Echtei's control. One glimpse of the woman inside and he can't keep his hands off. One heated touch and he gives in to the need to wreak havoc on anyone who touches Sylla--a woman who could never stay with a man forever tied to family and home. But even Echtei can't defeat what's chasing Sylla--a ruthless cyborg hunter who has shown that a Scoriah is no match for him. Echtei won’t give Sylla up without a fight. It's face the impossible or die trying, even if survival means war. Willing Skin asks some excellent questions about desire and bodies. The tech that Sylla uses makes her need to adjust to a body she wasn't born with. In many romantic commitments, we attest that we will love a person even though they will change through the years. In Sylla's case, she changes bodies fast. Luckily, Echthei wants her with whatever body she's got, even if she appears male to him. I also enjoyed the family dynamics in this book. The reader gets to know Echthei's clutch-mates and understand the special not-quite-human bonds that. I hadn't read any previous books in the series, but the characters who were the heroes of other stories were vivid enough that I'll have to go back and read from the start. Bonus: hot and chilling cyborg whose workings made me say both "ooooh" and "ewwww."